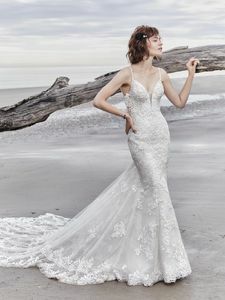 Description: Elegant lace motifs dance over tulle in this relaxed fit-and-flare wedding dress, trimming the illusion side panels, and V-neckline. Beaded spaghetti straps create a unique double-crisscross effect in the open back. Available with regular hemline (Sullivan, 8SS793) or illusion double-hemline (Sullivan Rose, 8SS793LT) to fit a bride‘s preference. Finished with covered buttons over zipper closure.